Animal Health is designed to provide basic information on animal health and disease prevention. It is divided in four sections. Part 1 contains the basic components of a disease prevention program. It includes fundamental information on the nature of disease, nutrition, sanitation, disinfection, immunization, quarantine, housing, hereditary abnormalities, and basic husbandry practices. 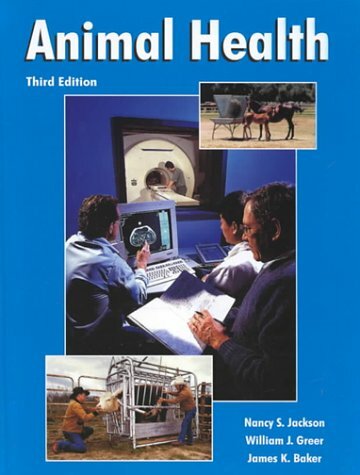 Part 2 deals with the structure and function of the various systems of the animal body and with the signs of disturbances and diseases that affect the digestive, genitourinary, respiratory, circulatory, and nervous systems. Part 3 includes diseases not commonly associated with a particular system of the animal body. Part 4 is devoted to the understanding of parasitology. Causes, clinical signs, prevention, and treatment are presented for the diseases covered in the text. Jackson, Nancy S.; Greer, William J.; Baker, James K.